We will go through aging and at times give us butterflies in the stomach. But given the right information and positive attitude, we can still enjoy life, be healthy in the process and age gracefully. It is projected by the U.S. Department of Health & Human Services Administration on Aging that by 2030, there will be more than 72 million individuals with age beyond 65, which is estimated 19% of population. If we are joining the bracket in the near future, it is not late to begin doing exercises to age gracefully. Fitness experts agree that exercise is vital key to aging gracefully and anytime, we are convinced, it is not late to begin exercising. It does not have to be vigorous as a young adult does, but simple exercises will do. Studies show that as we age, muscle mass reduces and we can lose up to 15 percent of our lean muscle mass, thus, less metabolic rate as we age in time. To prepare for this, we have to keep strong muscle mass that will help in burning calories for healthy weight, strong bones, and regains our balance. And it is not late to build strong muscles. Our human body is attuned to strength training at whatever age period we are. 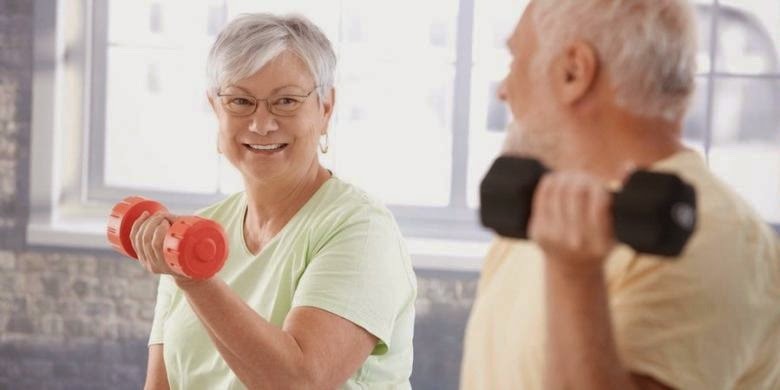 Strength exercises help lower symptoms of some common problems and issues, such as osteoporosis, depression, back pain, and diabetes, as we grow older. One way to increase physical strength for lean muscles is lifting weights. Just a simple strength training can improve bone density, general stamina, and balance. Building strong muscles also lowers risks of falls that result to fractures. Bone density decreases as we age, and as a result, our bones become weak and fragile, and are susceptible to fractures. Records show that there are more than 40 million Americans are at high risks for osteoporosis. This bone problem is common in women compared to men. Osteoarthritis is another bone problem that affect about 27 million Americans. It involves the cartilage of the joints breaks down that results to pain, stiffness, and loss of joint movements. Health experts suggest that the best way to handle this bone problem is to be active and keep a healthy weight. Inactivity can result to weak joints and stiffness. Exercises that involves motion and flexibility, endurance and strength are recommended. Simple exercises can keep our bones strong and dense. Weight-bearing is helpful since this exercise makes the bones work harder. Endurance fitness training like walking is an activity that can strengthen endurance. It increases heart rate and breathing which is good for the heart and general health condition. Other endurance fitness activities are dancing, swimming, tennis, cycling and the like. As we age, flexibility also decreases. Flexibility allows freedom of movement. Focus on exercises for neck, elbows, wrists, shoulders, hips, knees, and ankles. The National Institutes of Health reports that there is more than one-third of elder individuals over 65 years old experience fall annually, which usually result to injuries to hips. Some even had to undergo surgeries and disability. Balance and strength exercises can keep balance and lower the occurrence of falling. Health experts claim that regular exercises or physical activities that can reduce the decline in memory and protect us from dementia. Depression is also common to elders and exercise is believed to have antidepressant effect. Exercises may increase the serotonin levels in the brain that help improve our moods. Consult first with your doctor and licensed physical fitness coach to know the right activities for you. It is vital to begin slowly and improve health gradually. Too much and too soon may cause injury. 5- to 10-minute walk is a good beginning and build from there. To start with, create a weekly exercise plan and schedule your activities and stick to it. Consistency is very important. Watch for the days and times that work best. Endurance exercises are physical activities that increase heart rate and breathing for longer period of time. They are ideal for your lungs, heart, and circulatory system. Endurance exercises provides you energy for daily activities and hinder aging-related illnesses like heart problems, stroke, and diabetes. Some of these exercises are swimming, walking, running, cycling, tennis, and aerobics activities. Find gyms and senior centers in your place that offer exercise classes for older adults. These exercises make your strong and give you energy to do your daily tasks. They can also help in increasing metabolism that promote and maintain health weight. Strength exercises help maintain our blood sugar levels at healthy levels that can prevent diabetes and obesity. Strength and resistance exercises help prevent osteoporosis by keeping our bones strong as we age. These are simple and affordable physical activities we can do at home using free weighs, or going to the gym with friends. Flexibility exercises help us stretch our muscles and nearby connecting tissues. Health experts say that stretching prevents injuries and falls. Yoga is an ideal method of improving our flexibility. Yoga has various types where you can choose to fit your needs as an individual. You can perform yoga at home or at studios with friends. There are available books, apps, and DVDs to help you learn yoga. Balance and stability are vital in preventing falls that can result to broken hips and disability for elderly individuals. You can do simple balance exercises like holding on a table or chair for support. You can also ask somebody to support you in case we lose balance. Find a center for elderly that offer classes on balance. We can also consult our doctor for balance exercises that are appropriate for us. Get started now and live more fully! Exercises are always good for everybody, regardless of the age. It is never late to begin where we can benefit from these simple exercises. It does not have to be strenuous but simple and easy physical activities that can build stronger bones, firm muscles and flexibility, maintain balance and endurance. Find the right exercises for you. Consult your doctor now.